You can get hashtag suggestions for your Instagram photos right inside Later! For those marketing locally, you can even set the hashtags for images solution to any of 28 languages. How to switch languages. 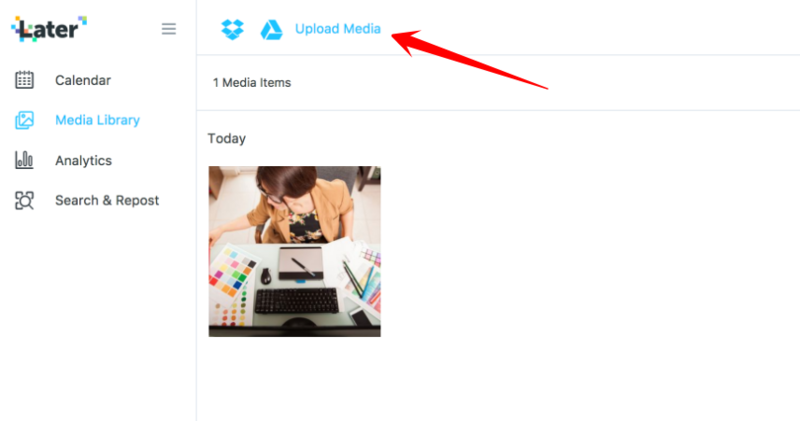 JUST ADDED: The RiteTag extension's hashtags for image solution shown in the video below also works with all web to Instagram direct publishing and scheduling solutions, including Later's - and all the others, too! 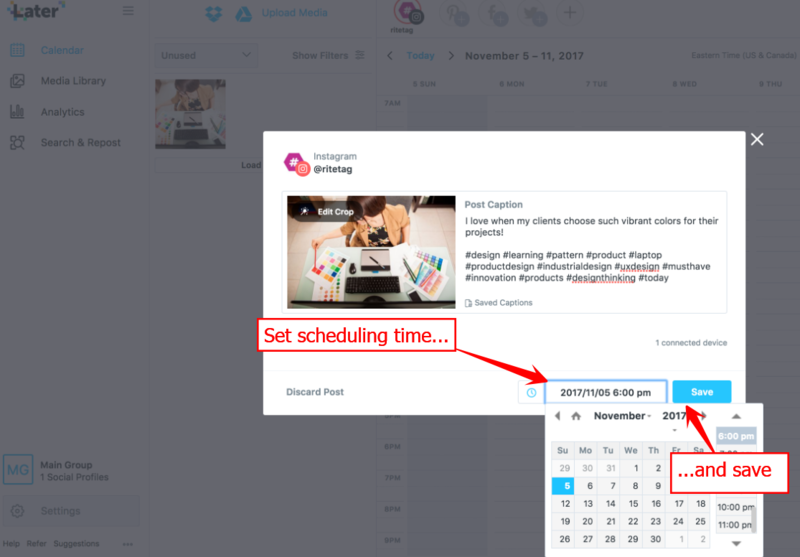 Just follow the instructions for desktop-to-phone Instagram scheduling in the video for use in direct Instagram desktop upload solutions. NOTE: The quick video below shows the previous RiteTag hashtag suggestions modal (popup). 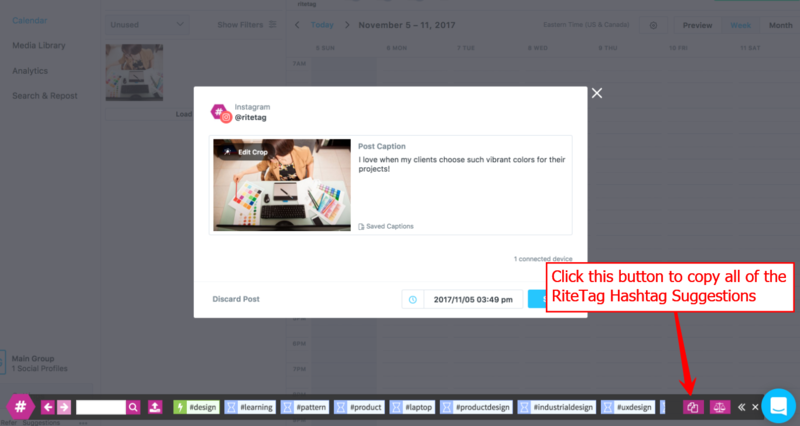 The current RiteTag extension is far faster to use since you see all the suggestions without scrolling, select what you want, copy, and close the modal. 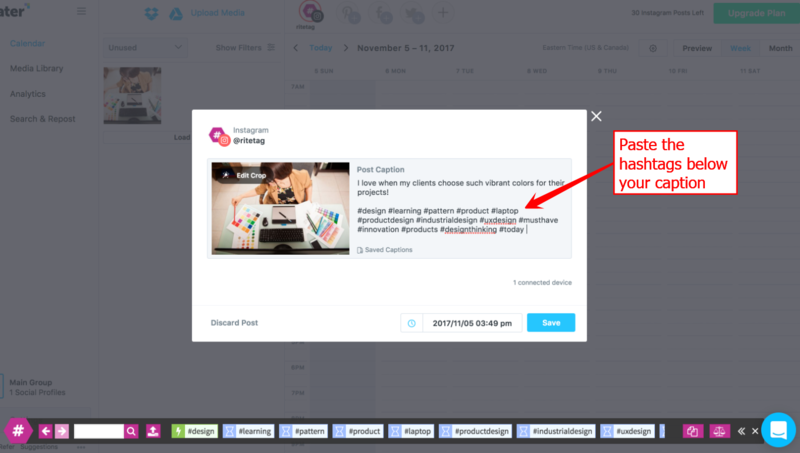 The quick video below shows using the updated RiteTag Pro extension with both Hootsuite and Buffer. It works with all social publishing sites, including Later. 1) Firstly, you will need to have the RiteTag extension for Chrome, Firefox or Safari installed. 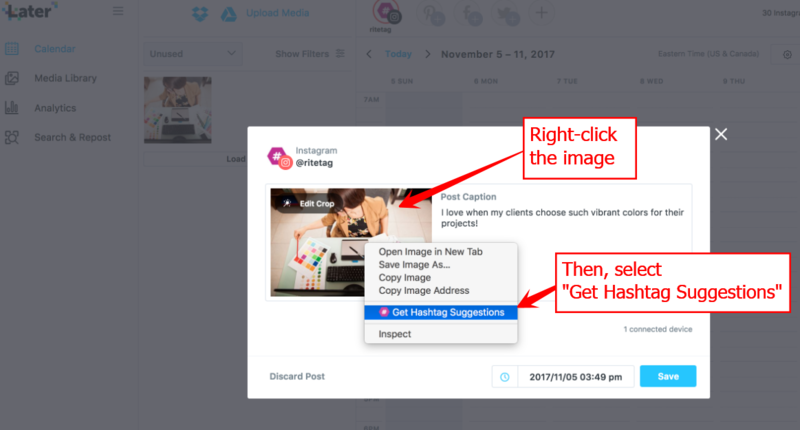 3) Do your image caption, then right-click the image and select "Get Hashtag Suggestions"
You can also right-click images in any web page for the Get Hashtag Suggestions solution, even if you didn't upload the image to a Later or other publishing composer. Also, there's a button beside search, on the left side on the RiteTag Hashtag Bar, for getting hashtags for any image in your computer: the up arrow button. How to set your RiteTag browser extension to a language other than English for hashtags for images. NOTE: This does not affect the highlighted text > right-click for Hashtag Suggestions solution. Login to the RiteTag extension if you're logged out. A subscription to RiteTag (paid) is required, and you need to always login with the same social profile or you will not access your paid RiteTag account. Right-click on the RiteTag browser button and select Options. 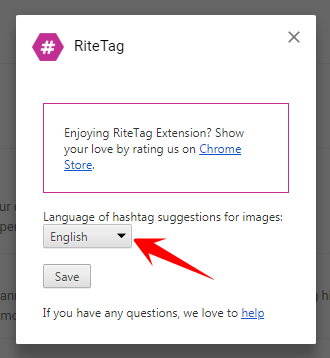 Choose from the many languages that the RiteTag extension will use when providing hashtag suggestions for images you right-click on.